With the start of its construction in 1991, its unique design revolutionized the city’s urban landscape at a historic moment of transformation. 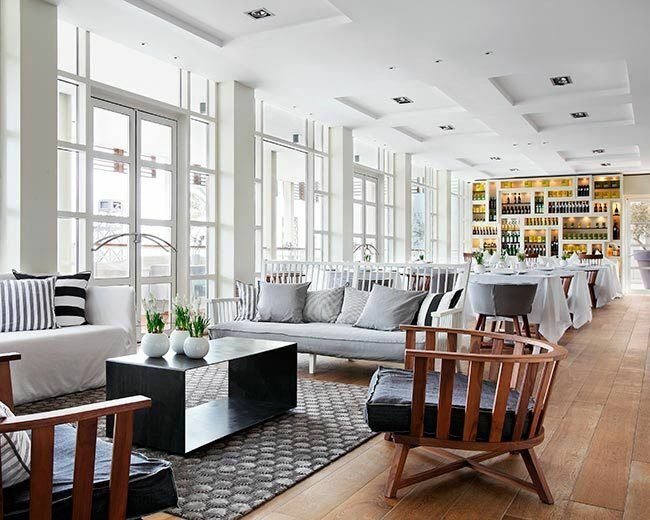 More than 20 years later, the architecture of Hotel Arts is only one of the reasons why this landmark hotel is an unmistakable icon of Barcelona. 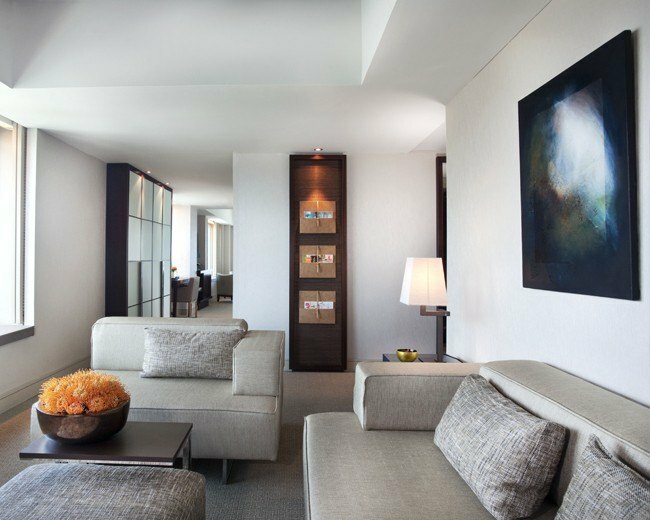 The transparency of glass, the warmth of wood and the sophistication of fine fabrics come together in every room at Hotel Arts. They blend in different ways to lend each space distinct personality and character, always under the paradigm of contemporary and refined style. The finishing touch is provided by Donna Stain, our floral artist for over 10 years, who’s responsible for the weekly renewal of the hotel’s decoration with elegant arrangements that combine colors, aromas and beauty to breathe life into each room. 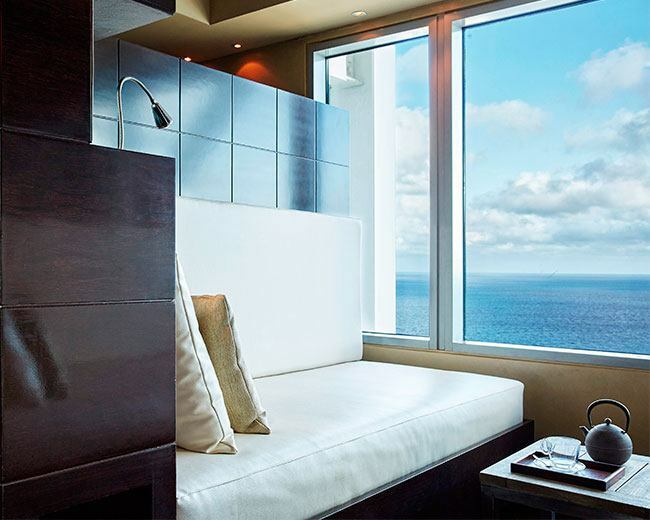 If there’s one hotel that lets you enjoy a complete panoramic view of the entire city, it’s Hotel Arts. Its almost 500 rooms and suites are distributed across the length and height of its perimeter, offering 360° views. A stunning observation deck allows you to lose yourself in the depths of the Mediterranean, follow the horizon to the coast and then in take the unmistakable skyline of Barcelona, with all its iconic buildings, including the Sagrada Familia and the Collserola Tower. 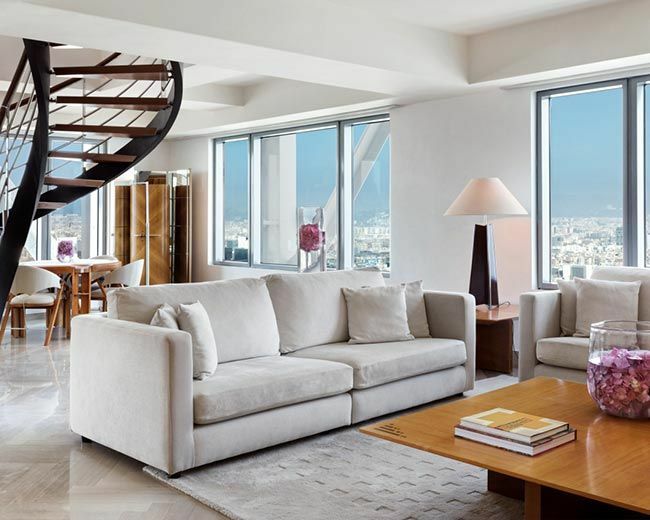 We present the Hotel Arts penthouses, exclusive two-story apartments located on the top floors of the building that combine the comfort of home and the luxury services of a five-star hotel with unparalleled views. Spaces that are intimate and warm, but with the hotel’s signature sophistication. The contemporary and elegant interior design features pieces by Jaime Tresserra, a renowned Catalan designer, including handmade furniture like his famous Carpett desk and his celebrated Jocker game table. Nature becomes a source of inspiration with endless green spaces and landscaped areas. 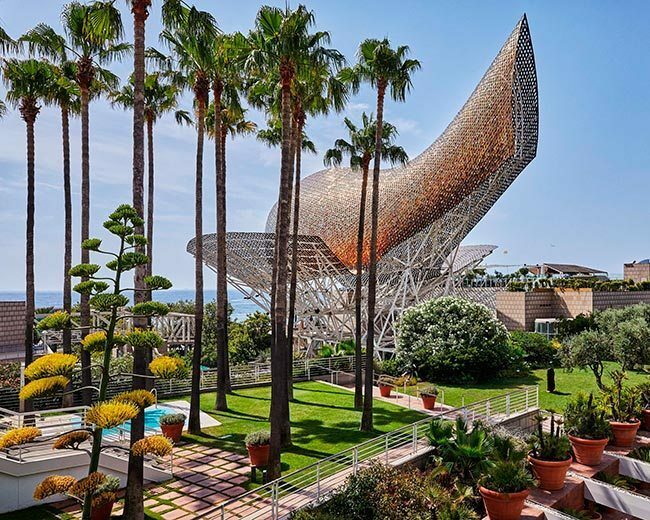 A stunning, natural outdoor environment in the shadow of Frank Gehry’s iconic golden sculpture: El Peix. Amidst the green of the vegetation and the blue of the Mediterranean you’ll find the pool and the outdoor gardens, small peaceful refuges where you can get lost in a good book, relax in the sun or enjoy one of our many cocktails and culinary options. What do you feel like today? Without even leaving the building, you can enjoy a wide range of options from breakfast until bedtime. Savor delicious Mediterranean cuisine at Hotel Arts’ five restaurants, designed for every time of day. Enjoy the breakfast buffet at Café Veranda, perhaps on its outdoor terrace; taste a selection of tapas and traditional dishes reinterpreted by Michelin-starred chef Sergi Arola; have a drink at dusk at P41 Bar & Coctelarium; savor the essence of the Mediterranean coast at the Enoteca restaurant; and be amazed by the casual dishes at Bites, where you can enjoy a snack, lunch or dinner whenever you want. Forget everything you’ve seen so far. Only at 43 The Spa can you enjoy deep relaxation at a height of almost 150 meters (490 feet), while watching the Mediterranean fade into the horizon. The top two floors of Hotel Arts are home to this urban sanctuary devoted to personal wellness. In addition to losing track of time in its aquatic area with a whirlpool, ice shower, steam bath and dry sauna, you can also choose from different treatments starring products from the prestigious Natura Bissé brand. We aren’t called Hotel Arts for nothing. Art is the hotel’s common thread and leitmotif: in every room and every hall you’ll find an original piece of art, all by Spanish artists, many of them Catalan. 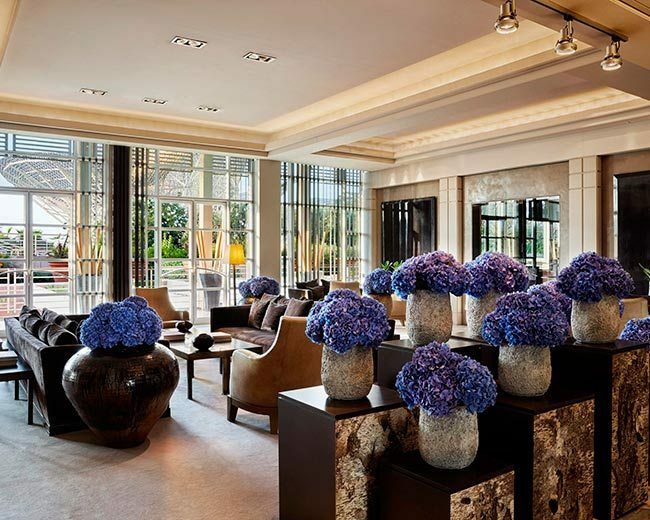 Examples include outstanding works like the impressive sculpture by designer Jaime Tresserra, located outside the penthouses; two breathtaking oil paintings by Ràfols-Casamada, on display at the reception for groups and penthouses; and the outdoor works by the masterful Manolo Valdés. The famed architect Bruce Graham was commissioned to erect this monumental project that forever changed the city’s skyline. 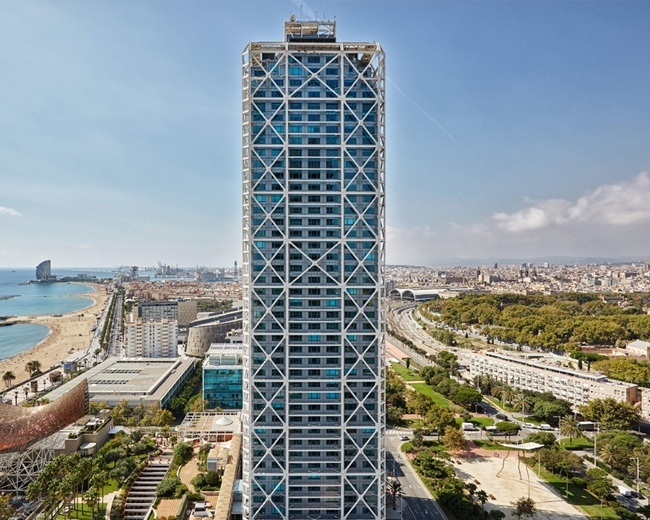 Its construction began in 1991, for the occasion of the 1992 Olympic Games in Barcelona, but it didn’t open its doors as Hotel Arts until 1994. The architect had long dreamed of creating a work like this one, in which the steel structure is visible on the outside and, through the glass walls, one can observe the sea between diagonal bracings. When he finished the project, Graham said that he had no more architecture lessons left to give.